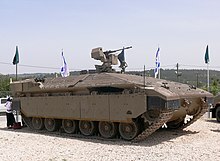 The Merkava (Hebrew: מרכבה‎, [mɛʁkaˈva] ( listen), "chariot") is a main battle tank used by the Israel Defense Forces. The tank began development in 1970, and entered official service in 1979. Four main variants of the tank have been deployed. It was first used extensively in the 1982 Lebanon War. The name "Merkava" was derived from the IDF's initial development program name. Design criteria include rapid repair of battle damage, survivability, cost-effectiveness and off-road performance. Following the model of contemporary self-propelled howitzers, the turret assembly is located closer to the rear than in most main battle tanks. With the engine in front, this layout is intended to grant additional protection against a frontal attack, so as to absorb some of the force of incoming shells, especially for the personnel in the main hull, such as the driver. It also creates more space in the rear of the tank that allows increased storage capacity and a rear entrance to the main crew compartment allowing easy access under enemy fire. This allows the tank to be used as a platform for medical disembarkation, a forward command and control station, and an infantry fighting vehicle. The rear entrance's clamshell-style doors provide overhead protection when off- and on-loading cargo and personnel. It was reportedly decided shortly before the beginning of the 2006 Lebanon War that the Merkava line would be discontinued within four years. However, on November 7, 2006, Haaretz reported that an Israeli General staff assessment had ruled of the Merkava Mark IV that "if properly deployed, the tank can provide its crew with better protection than in the past", and deferred the decision on discontinuing the line. On August 16, 2013, Israeli Defense Minister Moshe Ya'alon announced the decision to resume production of the Merkava main battle tank for the IDF Armored Corps. By 1974, initial designs were completed and prototypes were built. After a brief set of trials, work began to retool the Tel HaShomer ordnance depot for full-time development and construction. After the new facilities were completed, the Merkava was announced to the public in the International Defense Review periodical. The first official images of the tank were then released to the American periodical Armed Forces Journal on May 4, 1977. The first Merkava Mk. 1 tanks were supplied to the IDF in April 1979, nearly nine years after the decision to produce the Merkava Mk. 1 tank was taken. The IDF officially adopted the tank in December 1979. TGL SP Industries LTD develop and production of the Road Wheels. The Merkava Mark I and II were armed with a 105 mm M64 gun, A license built variant of the M68. The Mark III, Mark III Dor Dalet BAZ kassag, and the Mark IV are armed with an IMI 120 mm smoothbore gun which can fire all versions of Western 120 mm smooth bore tank ammunition. All Merkava tanks are fitted with a remote-controlled M2 Browning .50 heavy machine gun, aligned with the main gun and controlled from within the turret. The .50 machine gun has proven to be useful and effective in asymmetric warfare. 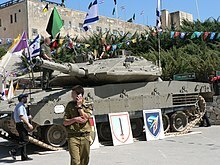 The Mark I, operational since 1978, is the original design created as a result of Israel Tal's decision, and was fabricated and designed for mass production. The Mark I weighed 63 tonnes and had a 900 horsepower (670 kW) diesel engine, with a power-to-weight ratio of 14 hp/ton. It was armed with the 105 millimeter M64 L71A main gun (a licensed copy of the British Royal Ordnance L7), two 7.62 mm machine guns for anti-infantry defense, and a 60 mm mortar mounted externally, with the mortar operator not completely protected by the tank's hull. In 2015 the IDF had begun a plan to take the old models out of storage and repurpose them as heavy armored personnel carriers. Cannons, turrets, and spaces used to store tank shells inside the hull were removed to create a personnel carrier that outperforms the lighter M113 APC. Converting hundreds of Mark II chassis provides a low-cost way to upgrade support units' capabilities to perform medical, logistical, and rescue missions. 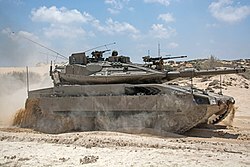 By late 2016, after 33 years of service, the last conscripted brigade to operate Merkava IIs was scheduled to transition to Merkava III and Merkava IV tanks for battlefield missions, relegating the vehicles to reserve forces for border patrols during conflicts and conversion to personnel carriers. Merkava III shooting a shell, FN MAG and smoke grenade. It then turns on the smoke screen system. The demonstration concludes with the throwing a green smoke hand grenade (1 m 16 s). When ammunition is unloaded the tank can carry up to 8 dismounted soldiers or 3 stretchers. Troops enter and leave the vehicle through the rear hatch. Removable modular armor, from the Merkava Mark IIID, is used on all sides, including the top and a V-shaped belly armor pack for the underside. This modular system is designed to allow for damaged tanks to be rapidly repaired and returned to the field. Because rear armor is thinner, chains with iron balls are attached in order to detonate projectiles before they hit the main armored hull. It is the first contemporary tank with no loaders hatch in the turret roof, because any aperture in the turret roof increases risk of penetration by ATGMs. 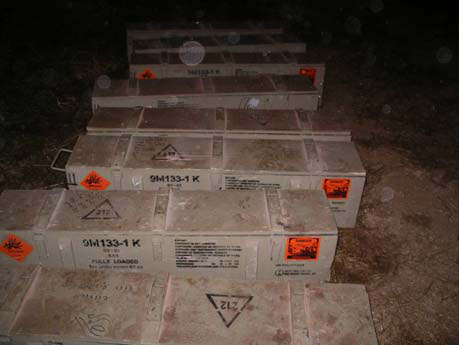 Tank rounds are stored in individual fire-proof canisters, which reduce the chance of cookoffs in a fire inside the tank. The turret is electrically-powered (hydraulic turrets use flammable liquid that ignites if the turret is penetrated) and "dry": no active rounds are stored in it. Some features, such as hull shaping, exterior non-reflective paints (radar cross-section reduction), and shielding for engine heat plumes mixing with air particles (reduced infrared signature) to confuse enemy thermal imagers, were carried over from the IAI Lavi program of the Israeli Air Force to make the tank harder to spot by heat sensors and radar. The Mark IV has the Israeli-designed "TSAWS (Tracks, Springs, and Wheels System)" caterpillar track system, called "Mazkom" (Hebrew: מערכת זחלים קפיצים ומרכובים, מזקו"ם‎) by troops. This system is designed to reduce track-shedding under the harsh basalt rock conditions of Lebanon and the Golan Heights. The model has a new fire-control system, the El-Op Knight Mark 4. The computer-controlled fire control system can acquire and lock onto moving targets, even airborne helicopters, while the tank itself is on the move. It includes line-of-sight stabilisation in two axes, a second-generation television sight and automatic thermal target tracker, a laser range finder, an improved thermal night vision system and a dynamic cant angle indicator. An Amcoram LWS-2 laser warning receiver notifies the crew of threats like laser-guided anti-tank missiles, which can fire smoke grenade launchers to obscure the tank from the laser beam. Electromagnetic warning against radar illumination is also installed. The Merkava IV has been designed for rapid repair and fast replacement of damaged armour, with modular armour that can be easily removed and replaced. It is also designed to be cost-effective in production and maintenance; its cost is lower than that of a number of other tanks used by Western armies. The engine can be replaced in field conditions within 30 minutes. The tank has a high performance air conditioning system and can even be fitted with a toilet for long duration missions. The Merkava Mark IVm Windbreaker is a Merkava Mark IV equipped with the Trophy active protection system (APS), designated "Meil Ruach" (Hebrew: מעיל רוח‎; "Windbreaker" or "Wind Coat"). The serial production of Mark IVm tanks started in 2009 and the first whole brigade of Mark IVms was declared operational in 2011. The Trophy APS successfully intercepted rocket-propelled grenades and anti-tank missiles, including 9M133 Kornets, fired by Hamas before and during Operation Protective Edge in 2014. Not a single Merkava tank was lost in combat operations in 2008 and 2014—despite the war in 2014 being a costly one for the Israeli Defense Forces. The system also notifies the tanks crew of the location that the projectile came from, allowing them to fire back quickly. It can transmit the coordinates to nearby ground and air units through the Tzayad battlefield management system. All friendly units in the theater are instantly apprised of the enemy's position, making escape and evasion difficult. In mid-2017, the IDF will begin trials of Elbit's Iron Vision, the world's first helmet-mounted display for tanks. Israel's Elbit, which developed the helmet-mounted display system for the F-35, plans Iron Vision to use a number of externally mounted cameras to project the 360° view of a tank's surroundings onto the helmet-mounted display of its crew members. This allows the crew members to stay inside the tank, without having to open the hatches to see outside. The first Merkava Mk 4 Baraks are planned to begin trials and testing sometime in 2020. The new tank will use advanced artificial intelligence capability to reduce the team members’ workload and help them more accurately locate and strike targets. "The tank’s sensors, along with a 360-degree camera fitted outside the tank, will allow troops to remain in the tank at all times". A new smart helmet, similar to the one Elbit Systems’ has developed for the F-35, will allow the commander of the tank to see exactly what happens outside the tank. The task computer of the Merkava Mk 4 Barak will present all information to crew members, and to the other tanks and vehicles present in the field, and provide more precise and rapid fire closure, which will allow the new tank to eliminate the target before it disappears. 4 (tank commander, driver, gunner, loader). May carry infantry as passengers. Cast and welded steel, in a spaced configuration Cast and welded steel, in a spaced configuration with composite add-on armor on the turret sides Steel frame with modular composite armor. The Merkava has participated in the following actions. The Merkava was used widely during the 1982 Lebanon War. The tank outperformed contemporary Syrian tanks (mostly T-62s) and proved largely immune to the anti-tank weapons of the time (the AT-3 Sagger and RPG-7) that were used against it. 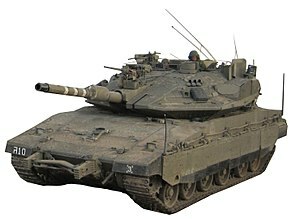 It was judged to be a significant improvement over Israel's previously most effective main battle tank, the Centurion. Israel lost dozens of tanks during the conflict, including a number of Merkavas. 401st Brigade (equipped with Merkava Mk. IVm tanks) alone killed between 120–130 Hamas militants during the ground fighting phase of Operation Protective Edge, according to the IDF. In 2014, Israel reported that exports of the Mk. 4 have started with the country's name not disclosed for security reasons. The Golani Brigade used two Namer IFVs during Operation Cast Lead. During Operation Protective Edge more than 20 vehicles were operated with great success and post operation analysis recommended procuring more of them. Two prototypes of Sholef ("Slammer", Hebrew slang for "Gunslinger") 155 mm self-propelled howitzer with an automatic loading system were built by Soltam in 1984–1986. 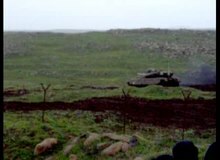 The 45-ton vehicle had a long 155 mm gun barrel giving a range of 45+ km. Using GPS, inertial navigation, and an internal fire control computer, it was also capable of direct fire while on the move. It never entered production. The Sholef's chassis, aside from a few minor modifications, is identical to that of the Merkava Mk.III. The glacis plate is unchanged, except for the addition of a support bracket for the gun turret, which is folded down when not in use. As such, the Sholef and Merkava series share a large percentage of common components. The front-left side of the chassis has a prominent exhaust louver, along with a much smaller port just in front of it; the exact function of this port is uncertain, though the soot seen around it in photos of the Sholef suggests it may be a new or additional exhaust port, or perhaps an outlet for a smoke generator. The Sholef can be ready to fire only 15 seconds after coming to a complete stop, and fire three projectiles in only 15 seconds. It is compatible with standard NATO 155 mm ammunition, and a total of 75 projectiles can be stowed in one Sholef, 60 of which are ready for combat. A crew of four is required to fully operate the Sholef. Air conditioning and heating for the crew are provided, as is a ration heater. The running gear consists of six unevenly spaced rubber-tired roadwheels on each side, and five return rollers, the second from the rear of which is noticeably larger than the others. The drive sprocket is forward, and the conspicuously spoked idler is rear. These may be partially obscured by track skirts, of which the Merkava Mk.III has ten panels, with a wavering underside, and little coverage of the sprocket or idler. For guiding operators and making round identification and fuzing, the Operator's Panel](OP) includes an LCD display with fixed instructions and one dot matrix line. The Loader Keyboard Panel (LKP) includes breech block closing switch, fire and local activation of the trays. On July 14, 2011, The Jerusalem Post reported that the IDF had begun developing a successor for the Merkava series of tanks. The development was started in part by the arrival of the Trophy active protection system. With the system's ability to intercept threats at a stand-off distance, there was a review of the need for vehicles like the Merkava to have thick, heavy layers of armor. The Merkava Tank Planning Directorate set up a team to study principles for a future tank and present ideas for an armored fighting vehicle to provide mobile firepower on a future battlefield. The team reviewed basic design principles including lessening its weight, armor thickness compared to an APS to intercept anti-tank threats, reducing the crew size, and the type of main gun. Horsepower capabilities and heavy and light track systems compared to a wheeled chassis were also considered. With future battlefield condition developments affecting design features, the vehicle may not be considered a "tank" in the traditional sense. By July 2012, details began to emerge of considerations for developing technologies for the new design. One possibility is the replacement of the traditional main gun with a laser cannon or an electromagnetic cannon. Other improvements could include a hybrid-electric engine and a reduced crew of two. The goals of the new tank are to make it faster, better protected, more interoperable and lethal than the current Merkava. ^ "Merkava Lite?". October 17, 2003. Archived from the original on April 17, 2017. Retrieved March 14, 2018 – via Haaretz. ^ "Israel", Studies (PDF), The Institute for National Security, November 20, 2014, archived from the original (PDF) on November 24, 2015 . ^ "Merkava Mk3/Mk4 Tank", Israel, GlobalSecurity.org Missing or empty |title= (help). ^ Maoz, Zeev (2006). Defending the Holy Land. University of Michigan Press. Chapter 5, note 16. ISBN 0472115405. ^ a b c d Roblin, Sebastien. 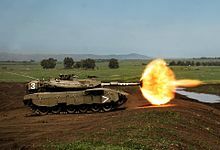 "America's M1 Abrams Tank vs. Israel's Merkava: Who Wins?". The National Interest. Archived from the original on December 1, 2017. Retrieved March 14, 2018. ^ Barzilai, Amnon, "Israeli Merkava tank production to stop within four years", Globes (online ed.) . ^ Oren, Amir (November 7, 2006). "IDF preparing for another conflict by next summer". Ha'aretz. Archived from the original on October 16, 2007. Retrieved September 29, 2007. ^ "Israel: Merkava tank production line re-activated", Defense market intelligence, August 17, 2013, archived from the original on February 2, 2014 . ^ Israel restarts Merkava tank production, UPI, August 16, 2013, archived from the original on November 26, 2013 . ^ "Depleted uranium", Salem news, May 13, 2010, archived from the original on October 28, 2014 . ^ a b "Merkava series". IDF. War Online. Archived from the original on May 27, 2008. Retrieved July 4, 2008. ^ "Israel's Merkava Main Battle Tank - Defense-Update - Online, International Defense Magazine". defense-update.com. Archived from the original on December 1, 2017. Retrieved March 14, 2018. ^ "Merkava Mk-4 Detailed". Defense Update. 2006. The tank utilizes an electric turret and gun control system, designed by Elbit Systems, which comprises two electrical brushless motors, produced by Bental Industries. ^ "Merkava Mk 1". Israeli Weapons. Archived from the original on May 26, 2008. Retrieved July 4, 2008. ^ Dunstan, Simon; Sarson, Peter (2003), Centurion Universal Tank 1943–2003, Osprey, p. 13, ISBN 978-1-84176-387-3 . ^ "Merkava Mk 2". Tanks. Israeli Weapons. Archived from the original on July 4, 2008. Retrieved July 4, 2008. ^ "Israel Military Industries 120 mm smoothbore tank gun MG251 (Israel)", Armour and Artillery Upgrades, Jane's, archived from the original on November 1, 2010 . ^ "Merkava Mk 3". Tanks. Israeli Weapons. Archived from the original on May 26, 2008. Retrieved July 4, 2008. ^ a b ARG. "Merkava Mk.4 Main Battle Tank - Military-Today.com". www.military-today.com. Archived from the original on December 1, 2017. Retrieved March 14, 2018. ^ a b c Gelbart, Marsh (May 20, 2012). "Modern Israeli Tanks and Infantry Carriers 1985–2004". Bloomsbury Publishing. Retrieved March 14, 2018 – via Google Books. ^ "Merkava Mk4 Detailed". Defense Update. Archived from the original on April 26, 2014. ^ "Army to Deploy Israeli Trophy Armor System on Tanks". frontpagemag.com. October 12, 2017. Retrieved March 14, 2018. ^ "Merkava Mark 4", Eurosatory, IL: MoD, 2010, archived from the original on May 25, 2010 . ^ http://mainbattletanks.czweb.org/Tanky/Merkava3.htm Missing or empty |title= (help). 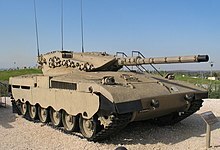 ^ http://mainbattletanks.czweb.org/Tanky/Merkava1.htm Missing or empty |title= (help). ^ Seale, Patrick (1989). Asad: The Struggle for Syria. University of California Press. pp. 382-383. ISBN 0-520-06667-7. ^ "Israel investigates Gaza tank blast". BBC. February 15, 2002. Archived from the original on November 4, 2013. Retrieved September 17, 2011. ^ "Victims of Palestinian Violence and Terrorism since September 2000". MFA. Archived from the original on April 3, 2007. Retrieved September 17, 2010. ^ a b c d e Cordesman & Sullivan 2007, p. 110. ^ Cordesman & Sullivan 2007, p. 111. ^ Nazzal, Mohamed (July 12, 2012). "Ali Saleh: Destroying the Merkava Myth". al-Akhbar. Archived from the original on October 12, 2013. ^ Blomfield, Adrian (August 15, 2006). "Israel humbled by arms from Iran". The Daily Telegraph. London. Archived from the original on April 16, 2008. Retrieved April 23, 2010. ^ "Hezbollah's use of Lebanese civilians as human shields" (PDF). Center for Special Studies. Archived (PDF) from the original on July 20, 2015. ^ "Kornet ATGMs captured in Ghandouriyeh" (JPEG). Center for Special Studies. Archived from the original on November 4, 2013. ^ "Why did Armored Corps fail in Lebanon?". Ynet. Archived from the original on September 1, 2006. ^ Barzilai, Amnon (August 30, 2006). "Defense establishment favors Rafael tank protection system". Globes Online. IL. Archived from the original on November 3, 2013. Retrieved August 22, 2013. ^ "God's chariot" (video). Google. Al jazeera. Archived from the original on February 22, 2011. Retrieved July 4, 2008. ^ Marcus, Jonathan (August 15, 2006). "Tough lessons for Israeli armour". BBC. Archived from the original on January 7, 2009. Retrieved July 4, 2008. ^ "Assessing the performance of Merkava Tanks". Defense Update. Archived from the original on May 13, 2008. ^ "IDF mulls spending plan". Ynetnews. Archived from the original on June 9, 2008. Retrieved July 4, 2008. ^ Katz, Yaakov (August 31, 2007). "New training aims to help tanks cope in hostile territory". The Jerusalem Post. Archived from the original on April 29, 2011. ^ Katz, Yaakov (August 13, 2009 21h20), "Security and Defense: 'The tank is one of the most technologically advanced platforms around'", The Jerusalem Post Check date values in: |date= (help). ^ Weiss, Efrat (August 7, 2009). "IDF successfully tests new tank defense system". Ynetnews. Archived from the original on August 9, 2009. Retrieved August 7, 2009. ^ Katz, Yaakov; Stoil, Rebecca Anna (December 21, 2010 15h43), "IDF predicts violence to subside despite Gaza pounding", The Jerusalem Post, archived from the original on December 23, 2010 Check date values in: |date= (help). ^ Harel, Amos (March 1, 2011). "IDF armor-defense system foils attack on tank for first time". Haaretz. Archived from the original on April 26, 2015. ^ "Rafael, IAI and IMI to jointly develop next-generation of active defense system for vehicle", Army recognition, December 30, 2014, archived from the original on October 26, 2014 . ^ a b "אמיר בוחבוט יום רביעי" [Rescued 15 tanks: Armored Iron Dome Gaza], Walla (in Hebrew), IL, 30 ביולי 2014, archived from the original on February 8, 2015 Check date values in: |date= (help). ^ Israel Defense, October 13, 2014 התעניינות עצומה ב'מעיל רוח מערכת http://www.israeldefense.co.il/he/content/התעניינות-עצומה-במעיל-רוח התעניינות עצומה ב'מעיל רוח מערכת Check |url= value (help), archived from the original on March 16, 2016 Missing or empty |title= (help). ^ "The stars of Operation Protective Edge: the tanks that cracked the terrorist infrastructure of Hamas". Maariv. Israel. August 25, 2014. Archived from the original on July 15, 2015. 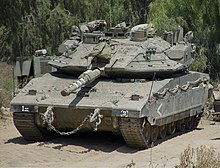 ^ "Israel sells Merkava tank to foreign military for budget reasons: report - World News - SINA English". english.sina.com. Archived from the original on March 4, 2016. Retrieved March 14, 2018. ^ a b "LIC Modeled Merkava Mk-3 Baz". Defense Update. Archived from the original on June 27, 2007. Retrieved July 4, 2008. ^ "Slammer". Israeli Weapons. Archived from the original on June 17, 2008. Retrieved July 4, 2008. ^ "IDF considering replacements for heavy Merkava tank", The Jerusalem Post, July 14, 2011, archived from the original on January 9, 2013 . ^ "After the Merkava: The Next Generation Tank", Israel defense, August 14, 2011, archived from the original on October 16, 2013 . ^ "The IDF's future tank: Electromagnetic cannon", The Jerusalem Post, July 12, 2012, archived from the original on January 3, 2013 . ^ "Israel lightens up: Will replace heavy tanks with versatile light armored vehicles", The World tribune, January 16, 2013, archived from the original on February 2, 2014 .